Here's a new thing I've been working on. Hopefully they'll be finished in the new year. I've bought and lined some display boxes and am creating some sets to go on sale in the shop. Here's a preview. Top is a barbed and tanged typology set, one each of all the 5 kinds used in Britain. 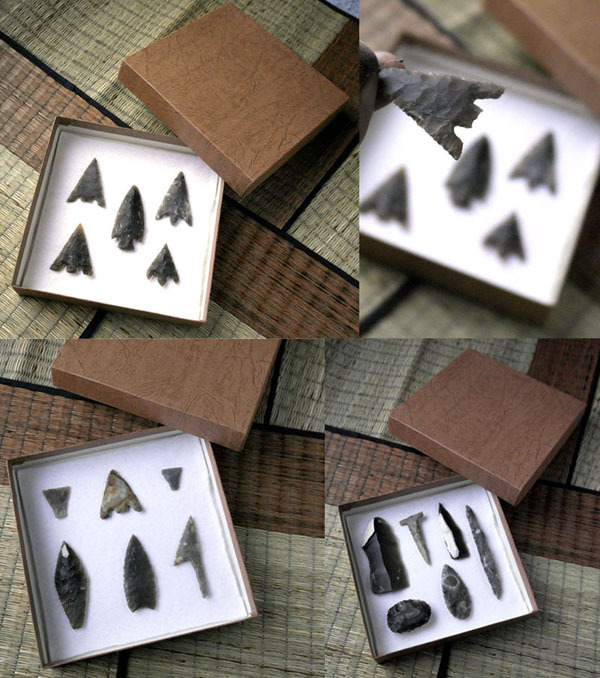 Bottom left is a British Neolithic arrowhead set, one of each of the six kinds of arrowheads found. Finally a Neolithic tool set. Have you considered framing a few sets? Or even just one in each frame. I've always thought that one well framed arrowhead would make a great wall display. Especially if you were able to purchase a whole range of different framed arrowheads. Maybe encourage someone to collect them one by one. Before I bought the boxes I considered frames, but a decent looking one is expensive. The idea of this is it allows a lot of merchandise to be sold in one go and the box doubles for postal packing so keeps costs down. . They look smart, i wouldnt mind having those myself. maybe after xmas. That's the big problem, isn't it, getting good stuff like that out there at a price people are willing to pay. There are just so many things being produced by countries paying a pittance to their poor workers, that it's difficult to compete. Even when the fun is in making the things, it is good to earn a bit from them too. Did you see the Ebay auction I posted with arrowheads from India for 8p each. Very low quality admittedly, but a petty stone. That's why with these sets I went for British knapping. You can buy cheap low quality American Indian arrowheads from India, expensive great quality ones from the US, but only one place can you get British ones made of British flint. I agree with you, and the thing about your boxes is that you're giving your buyers the option as to how they want to display the items. I've seen your webstore, and the quality of your flint tools are spot on. I can see why someone who is into say, archery, might want to buy the cheap bag of Indian arrowheads, if they are into primitive. There again, if you're into authenticity, Indian flint isn't.